Today's Image of Mars is a closeup of a pit on the Eastern flank of Pavonis Mons, a large volcano located in the Tharsis region of Mars. The pit is 180m at its widest diameter. Even though the Western half of the pit is shrouded in shadow, HiRISE was able to peer into the shadows and determine what lies within. The boulders visible within the pit range from less than 1m to 5m in diameter. The HiRISE team reports that the boulders are covered in sediments. Pits like the one below are called skylights and often form when the roof of an inactive lava tube collapses. 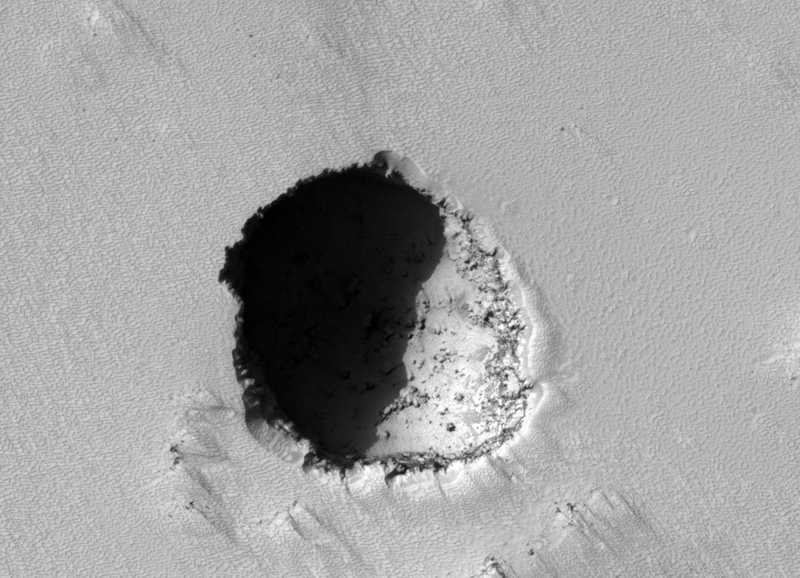 Clicking on this image will take you to the original captioned image from HiRISE.